Play it loud and play it proud. 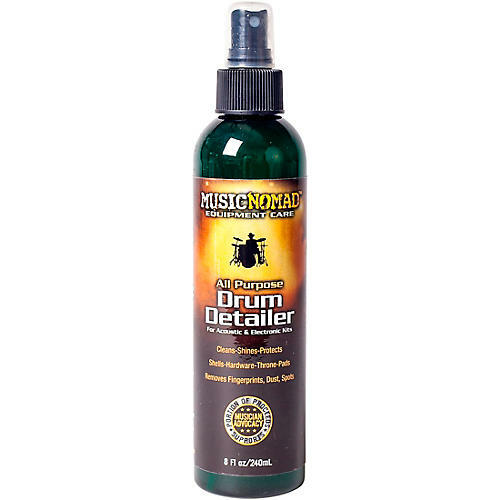 Let MusicNomad's Drum Detailer Polish do the dirty work and safely clean your entire drum set fast and easy. A single spritz from the atomizer cleans drum shells, hardware, electronic drum pads and drum thrones. It even can be used for light-duty cymbal cleaning for dirt and grime removal. Its antistatic agents help reduce dust from binding to your drum set. Safe on all matte and lacquer finishes, the silicone-free, water-based formulation is infused with gloss enhancers and UV protectants to give your drums a long-lasting, great shine. DW Drums even recommends this polish for proper care of their performance and Collector’s Series drums. Works great on other brands such as Pearl, Tama and Zildjian as well. Small in size but big on results, you can take it everywhere and it even smells great!